1. During the Easter Vigil, the Easter Candle was lit from the fire: Cristo Luz del Mundo. 2. The procession to the church with the Easter Candle: Christ our Light. 3. The choir sings the ancient hymn of the ‘Gloria’ to acknowledge the resurrection. 4. A magnificent view of the altar with the Easter decorations. 5. The statue of the Sacred Heart is decorated with fresh flowers and a water fountain. 6. The beautiful statue of our patroness saint. 8. The catechumen is sealed by the gift of the Holy Spirit. 9. The statue of Our Lady, notice the stained glass from the old church. 10. The statue of St. Francis decorated with Easter lilies. 11. Father Ricardo and Frank Paz, at White Sands Missile Range during the marathon on March 30th which commemorates the “Bataan Death March”, they finished the 26.2 miles in 7 hours. 12. Father Manuel Ibarra is posing with Father Ricardo during the Marathon. 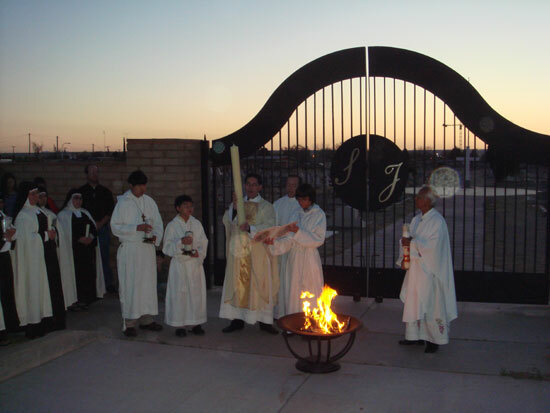 Father Ibarra is the pastor of St. Thomas Aquinas in Lovington, NM. 14. Mary’s garden with new flowers. Thank you to all volunteers and sponsors.